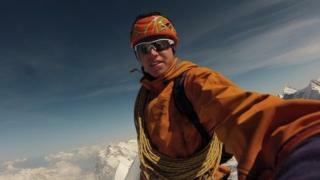 A British climber whose mother died on K2 has been reported missing on a peak in Pakistan. Tom Ballard and Italian climber Daniele Nardi are trying to reach the summit of Nanga Parbat - nicknamed "Killer Mountain". The last contact from the pair was on Sunday, from an altitude of about 6,300m (20,669 ft). A search operation has been delayed amid tensions between Pakistan and India. Mr Ballard, from Derbyshire, is an experienced climber and the first person to solo climb all six major north faces of the Alps in one winter. He is the son of Alison Hargreaves, who was the first woman to conquer Everest unaided in 1995. She died the same year while descending from the summit of K2, the world's second highest mountain. Nanga Parbat is the world's ninth highest mountain and notoriously difficult to climb. A number of deaths have earned it the "Killer Mountain" label. It has been reported that weather was poor in the area at the time. Pakistani authorities hope to launch a helicopter search operation, but said it has been slowed by tensions with India. Mr Ballard, 30 has been living in Italy's Dolomites mountain range with his father for the last few years. Nicholas Hobley, from online magazine Planet Mountain, said Mr Ballard was "regarded extremely highly in the climbing world". "He's an absolutely fantastic climber and someone you would want to have with you on an expedition." Nanga Parbat has only been climbed in winter once before as it is "extremely dangerous", he said. He said Mr Nardi had been attempting to climb the mountain in winter every year since 2012 and knows the area well. A statement from Mr Nardi's team said the "situation was worrying" because bad weather is forecast for the next few days. They said they were "waiting for news from base camp" and experienced Pakistani mountaineer Ali Sadpara was on standby to fly to Nanga Parbat to scour the mountain when the airspace reopens. A Foreign Office spokesman said they were in contact with Pakistani authorities regarding Mr Ballard's disappearance.